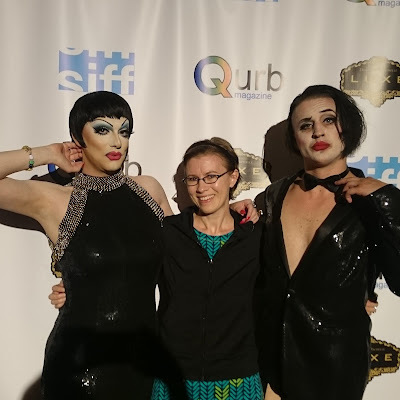 Last night at the SIFF Egyptian Theater, I was presented with a dizzying mix of glamour, glitter, bare buns and sobering reality.The 43rd Seattle International Film Festival presented a screening of Cabaret (1972) with a real cabaret before it, just like those live shows they used to have before movies in the early days. Headliner Robbie Turner led a lively cast of characters through a revue that had me laughing so hard I cried. I mentioned that I felt underdressed in the face area and Robbie said that I was fine and they were the clowns. I honestly replied that I love that, but later I wished I'd told him how important the glamour and entertainment they offered was to lifting our spirits. The act is fun, but their impact is serious business. It really was a fun act too. Miller pranced on the stage in a glittering jacket and G-string to start the proceedings. Then came Turner, a dead ringer for Ms. Minnelli in his Liza drag. The adorable Abbey Roads pranced through a high-energy number and astoundingly leggy Visage "Legs" Larue made a few appearances, but for the most part this was Turner's showcase. Several audience members were dragged on stage to participate in the act and they were all so game and amusing themselves that you had to wonder if they were plants. Of course, they seemed a little too embarrassed at first for that to be the case. I don't think I'd ever seen such a game group of people thrust into the spotlight. Turner really captured the snap and bubbly energy of Liza, while mostly discarding the star's self-deprecating humor. It was great to see a full-on fierce Minnelli. I think the audience was primed to more fully enjoy the film, though it has a great deal of sobering reality mixed in with its glittering delights. 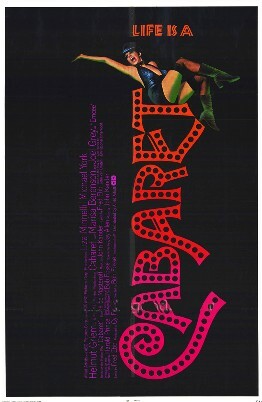 Based on a pair of novellas by Christopher Isherwood, that are usually published together as The Berlin Stories, and a Broadway musical, director Bob Fosse takes this tale of hedonistic life in a city starting to kneel to the Nazis in a bitter, raunchy direction. Cabaret has a gorgeous, affecting cast of characters, including model-turned-actress Marisa Berenson and the handsome Helmut Griem, Fritz Wepper and Michael York. However, this show belongs to Liza and her master of ceremonies Joel Grey. The film captures the best of what these stars of the stage had to offer. As the MC of a 1930s Berlin nightclub show, and a sort of one man Greek chorus of the Nazi terror to come, Grey is all edges and knowing grins. His decadence is candy coating for the fear and frustration at his core. He knows the good times are ending and he is going to dance all the way to hell with a face-stretching grin forced onto his face. It is Liza that really grips you though. When she hits the stage she is fully in the moment, sacrificing everything she has to her performance. Watching her perform always makes me think of a passage in Sam Wasson's Fosse biography where she is leaping around telling the choreographer how much she loves show business. You can sense that when she's on the stage. Performing gives her life and that is intoxicating. Much like her mother Judy Garland, Minnelli can be a goddess on the stage one moment and reveal her deepest hurts the next. She has her mother's gift for showing vulnerability, whether by speaking a little bit too loudly at a dinner party where she feels out of place or by speaking simple truths, with her huge eyes rimmed in tears, little droplets attaching themselves to those long, false eyelashes. Liza's is a performance for the big screen. Though I had watched Cabaret at home several times, last night was the first time I truly saw it and appreciated the grand visuals and performances juxtaposed with horror and heartbreak. 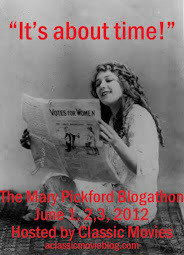 I am glad SIFF is dedicated to promoting great films through its archival offerings. This screening was evidence of why that attention to our cinematic heritage is so important: for the lessons that always need to be relearned, the beauty of the films that have come before and the charisma of the greatest stars. Yep, Minnelli is a versatile actor and underrated, me thinks. Oh, that is a gorgeous woman in the middle! Aw, you're swell! Yeah, it makes me sad that Minnelli isn't a bigger deal. The people who love her really love her, but so many people get caught up in her personal dramas and don't see how amazing she is.